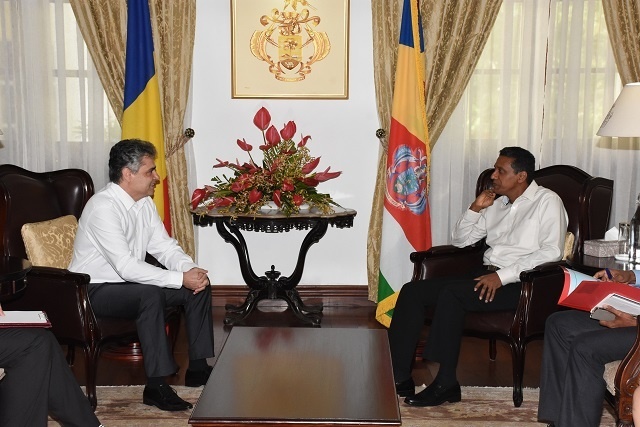 (Seychelles News Agency) - The President of Seychelles, Danny Faure, and the new Romanian ambassador discussed how the two countries can strengthen bilateral and multilateral cooperation and future support for each other on the international arena. 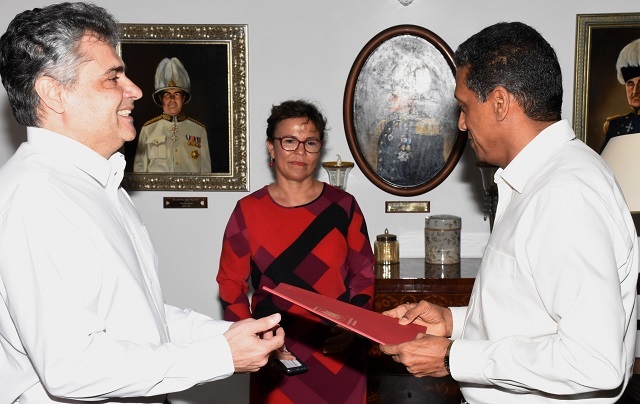 The ambassador of Romania to Seychelles, Marius Boranescu, presented his credentials to Faure on Tuesday at State House, Victoria. “My mission here will be first of all to reinvigorate the political dialogue. I have already talked to the president and vice president about the next visit of Romanian officials to Seychelles, planned for April this year,” said the ambassador. Boranescu is the first Romanian ambassador to the 115-island archipelago in the western Indian Ocean. Further discussions revolved around a possible economic partnership between Romania and Seychelles. The newly accredited ambassador said that such a partnership should be mutually rewarding for both countries. “There is the growing interest from Romanian companies to come to Seychelles to invest and trade with all the sub-Saharan countries on Africa but also in the Indian Ocean area,” said Boranescu. Boranescu said he wanted to see what the priorities of Seychelles are as well as the opportunities. After this, the ambassador and his team will do their best to transform the plans into concrete solutions for cooperation. Seychelles and Romania, a southeastern European country, established diplomatic relations on June 25, 1974. The two countries share excellent cooperation in the international forum, as “both of our countries are committed to peace and security through democracy and a just society,” said Boranescu. Romania is a member of the European Union (EU) and is holding the presidency of the European Council from January to June this year. The EU remains Seychelles' number one trading partner, and its largest export market, and under the Economic Partnership Agreement offers Seychelles' exports complete quota-free and duty-free access to the EU market of 500 million consumers. “I think we should work, especially this semester also from the angle of the EU to strengthen this partnership,” said the Romanian ambassador. When it comes to the tourism sector, Boranescu said that an increasing amount of Romanian citizens would like to visit Seychelles. The newly accredited ambassador will be based in Pretoria, South Africa.